Based on reader feedback, one of the more popular GyroQ hacks on ActivityOwner.Com is the Put it in front of the Door script that enables you to setup your computer to automatically unload your GyroQ queue and refresh your ResultsManager dashboards each morning. The new ResultsManager Ribbon-interface that Gyronix created for MindManager 7 makes it a compelling upgrade. While MindReader has been updated to work successfully with the new version, until now the “run:rm:dashboard” command at the heart of “Put it in front of the door” has been broken. I recently got an email from James mentioning that the script was working fine under version 7 on his tablet PC. I was puzzled by this until hearing from Gyronix that Mindjet has traced the run:rm:dashboard issue to some old 2001 Microsoft.Ink dlls (version 1.5) in “c:\program files\common files\microsoft shared\ink” that are present on most people’s systems. Its not clear why tablet pc files need to live on non-tablet PCs, but it explains why it works for Jim on his tablet. MindJet will at some point issue a patch or service pack to address the issue, but in the meantime, I think I’ve identified a way that users can update their systems to get the run:rm:dashboard script working. I found this article about getting a Sudoku program running on non-tablet PCs by installing the Tablet PC Edition Software Development Kit. 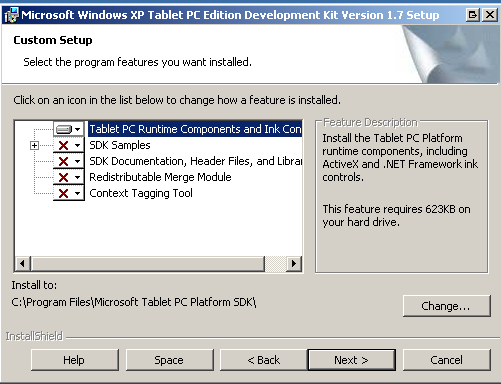 I found doing a custom install and just installing the “Tablet PC Runtime Components…” was sufficient to updated the necessary dlls on my XP system. If you want to use “put it in front of the door” under V7, give this a try and let me know how it goes. AWESOME! It looks like this works! I can’t wait to have my dashboards ready and waiting for me to trip over them again! Glad I could help – in a round-about sort of way! Thanks – this is working for me now. Does MM8 include a solution for this issue? Hi Chris — I’m not aware of any ongoing problems — even with version 7. I’m not sure if that is because everyone applied the patch above or if it was fixed in 7.1 or 7.2. Are you seeing any issues? No, i was thinking of implementing this, but as there had been issues thought I’d check first. Thanks.